This week, I noticed a tweet from the editor of the medical journal The Lancet, Richard Horton (screenshot below). The attached image seems to be a photograph of a slide from a presentation. The data comes from a review of the evidence regarding the impact of statins on health outcomes from 2010 . This study amassed evidence from 26 individual statin studies. 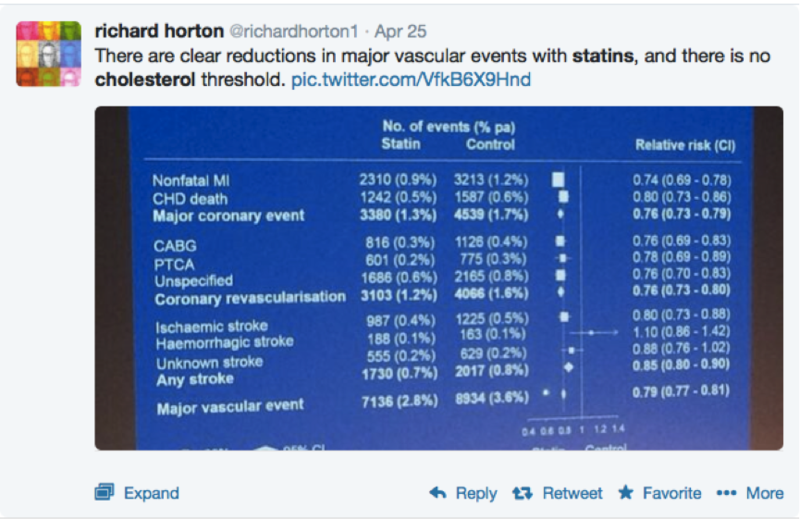 The bottom line of the slide pictured tells us that statin therapy reduced ‘Major vascular event[s]’ by 21 per cent. Richard Horton seems very taken with the results (perhaps this has something to do with the fact that the study was published in his journal). However, there are a few things about the review that I think are perhaps worth bearing in mind. Its authors (from the Cholesterol Treatment Triallists collaboration) essentially concluded from their data that more intensive statin therapy produced better outcomes. They extrapolated their findings to conclude that if LDL-cholesterol were to be reduced by 2-3 mmol/l, then risk would fall by 40-50 per cent. Are these conclusions founded in good science? Firstly, the ’40-50 per cent reduction’ claim is an extrapolation. It’s not based on actual data, just on a projection the authors make from existing data. In other words, it’s not very scientific at all. But also, statin drugs have a number of different mechanisms (including an anti-inflammatory effect) that might allow them to reduce cardiovascular disease risk in ways that have nothing to do with cholesterol reduction. Now, when we intensively lower cholesterol with statins, non-cholesterol-related effects (e.g. anti-inflammatory action) will generally be increased too. The bottom line is we cannot assume that any additional benefits from more intensive statin therapy come from more intensive lowering of cholesterol per se. In this ‘meta-analysis’, the results of a large number of studies was pooled. The problem is, these studies used a range of different drugs at different doses. Sometimes, the drugs were being tested against placebos, and sometimes they were being tested against other drugs. A more scientific way of determining if higher doses of statins really are better is simply to compare the effects of two doses of the same statin. You’d be surprised how rarely such studies are done. One such example, though, is the so-called TNT study . Here, individuals with heart disease (very high risk of future vascular events) were given either 10 or 80 mg of atorvastatin for an average of about 5 years. The higher dose did lead to lower LDL levels and lower risk of death due to heart disease. The absolute reduction in risk was 0.5 per cent, by the way, which meansrisk of dying from heart disease fell by about 0.1 per cent per year (so nothing to get too excited about). Also, the higher dose of statins (a full 8 times the lower dose) did not lead to a reduction in overall risk of death. In other words, taking 8 times the lower dose of atorvastatin did not extend life by a single day. In one study assessing the relationship between statin therapy and cholesterol and CRP levels, it was discovered that “Patients who have low CRP levels after statin therapy have better clinical outcomes than those with higher CRP levels, regardless of the resultant level of LDL cholesterol.”  (emphasis mine). So, despite what the authors of the Lancet review would have us believe, there is evidence that statins primarily work through mechanisms that are independent of their cholesterol-reducing effects. But, I’d also like to focus a little on other findings from this review, specifically the impact of statins on overall mortality. First of all, it’s worth bearing in mind that for people who do not have a history of heart attacks or strokes (so-called ‘primary prevention’) statins do not reduce the risk of death overall. They do appear to reduce the risk of death in those with a history of cardiovascular disease (so-called ‘secondary prevention’). In the Lancet review, overall risk of death was found to be reduced by 10 per cent (a result that was statistically significant). However, this relative risk reduction needs to be taken in the context of overall risk. It turns out, that over the course of a year, risk of dying was reduced from 2.3 per cent to 2.1 per cent. In other words, the absolute risk reduction per year was 0.2 per cent – not exactly earth-shattering. There’s another measure that is useful in gauging the effectiveness of a treatment: the ‘number needed to treat’ or ‘NNT’. We can use the data to calculate, for example, the number of people needed to be treated with statins for a year to prevent one death. The answer is 500. The NNT for deaths due to cardiovascular disease is even higher: 1,000. Bearing in mind the relatively high risk of serious side-effects (the best estimates comes in at around 20 per cent), one would have to wonder on what the enthusiasm many doctors, researchers and medical journal editors have for statins is really based. Only they can possibly know. 13 Responses to Does the claim that more intensive statin therapy is better really stand up? I am familiar with ultrasound scans of carotid to assess vessel health but thought this technology was not used for coronary arteries. Is the ultrasound commonly used for coronary arteries? Available to the public or just research participants? The ultrasound is done ‘intra-vascularly’, which means it’s done via a device that is fed into the arteries via an artery (usually in the groin). It’s not commonly used in clinical practice here in the UK, to my knowledge. WOSCOPS, a famous statin study that doctors like to quote in support of statin therapy, showed clearly that, in the case of its particular statin, pravastatin that: “pravastatin may, through pathways not involving lipid lowering, beneficially affect atherosclerosis” and “the observation suggests that in WOSCOPS, the influence of pravastatin on CHD risk could not be completely explained by the reduction in LDL cholesterol”. The study participants had their lipids lowered by varying amounts but the reduction in cardiovascular events was all over the place and didn’t correlate with more or less reduction in cholesterol. Moy Peralta : Your reference to the effects of “high dose” statins on your husband is similar to what happened to my daughter. MRIs reveal that 80 mg doses for 2 months caused cell damage in the pons area of the brain. For the past 3 years she has needed the aid of a “walker” when mobile. Dr Briffa, I think you are in a small minority of doctors who actually have the intellect to think for themselves and question what other medical professionals blindly follow. Thank goodness for you and those like you!! I currently work in a secondary school and can see so many examples of incorrect information being taught as well as the usual brainwashing of the next generation as regards things like ‘a healthy diet’ etc etc. They are not encouraged to question anything, just to absorb and regurgitate information from books, teachers and the internet. So with that start in life, is it any wonder that there’s no room for debate? I don’t know what to do, my gp has prescribed me a statin for an unfasted reading of 7.2 (normal hdl/elevated tri-g’s and ldl).I already take 5mg ramiprill and 5mg amlodopine and dont fancy having to take another daily pill..im only 40! Andy. You have my sympathy. I was 46 when I had a TIA. My blood pressure was high and my cholestral was 8.9. I was given 3 BP pills and a statin. BP and Cholesteral both came down to “normal”. Six years later I was crippled with joint and muscle pains. Quite by accident I discovered that the statin was the main culprit. The GP then put me on a merry-go-round of one statin after another – all of them gave the same crippling problems. I took the decision to dump them and have never taken any cholesteral lowering drug since. My cholesteral returned to 8.9/9.1 and remained in that region for 12 years (so it didn’t lead to instant death!). Six months ago I started a new eating regime by dropping sugar and wheat flour from my diet, increasing the vegitables and satutrated fat by having a cooked breakfast. I am not following anything as extreem as an Atkins Diet, but it is along the lines of Dr Briffa’s books. Recent blood tests show that all health counts have improved, including BP so I am hopeful of the BP medication going the same was as the statins eventually. My advice to to do as much research as you can and make your own decision. Don’t let a GP scare you – unfortunately some GP do try that strategy. If you go down the diet road – don’t follow the advice given by the NHS and the British Heart Foundation. I’ve been there (several times). It didn’t work for me. I’ve done so much reading about all this but would dearly love a bit of clarification on the matter of elevated cholesterol levels. Does anyone really know what a ‘normal’ level of HDL/LDL should be? Who decided? As I understand it (and I maybe completely wrong as I am not medically trained, I merely possess the body I live in) elevated LDL results from some form of inflammation. My overall cholesterol is now 7.2 (it was 4.7 on statins) of which HDL 3.5, LDL 3.5 and trips .6. HOWEVER, I have psoriasis and MGUS, both of which as I understand it could adversely affect my LDL level – in effect the LDL is doing its job. My diabetic nurse won’t consider this and is not happy that I am a cholesterol refuser (nasty side effects) I do low carb and only good proper fats and I feel so much better off the statins but a tiny anxiety-ridden part of me is waiting for a stroke/heart attack. There is so much pressure to comply. Your cholesterol level is pretty common for someone doing low carb. HDL is high and Trigs are low which should mean you’re at a low risk of diabetes or insulin resistance. This is the according to some people the best indicator of a healthy cholesterol ratio. Thank you, Grant. For the record, I’m 71, thin as a rake and had MODI diabetes since I was 15. Your message has greatly reassured me. I KNOW in my heart of hearts that I’m doing the right thing but it does take courage to defy medical advice – It’s lonely being a rebel. It’s not supposed to work for you, it’s supposed to work for the pharmaceutical companies. You eat their diet, then take their pills. Simple! Since you frequently write about cholesterol and heart disease thought to share this study article out of the University of UCLA. It’s on the research of cardiologist Matthew Budoff, MD. It mentions that he has conducted 4 randomized studies on patients taking aged garlic pills. Results found were those taking the garlic had their plaque levels decrease, while those taking placebos saw increased plaque growth. I haven’t really looked up the studies, viewed one quickly, to see about their quality. Looked interesting though and so thought to share. Saw this video interview of Dr. Budoff meeting with a patient discussing his CT scan results which showed decreased plaque growth. If true that garlic can reserve plaque growth, it reminds me of a mention Dr. Uffe Ravnskov makes in his book Cholesterol Myths. He theorized that heart disease plaque was possibly caused by an infection. If I remember correctly garlic is helpful at fighting infections. Believe reading during WW2 the Russians and German militaries used garlic in this fashion on wounded troops.